Let�s furnish your fun early childhood classroom! Start off with the best early childhood Storage Units. There are audio caddies for books on tape and headphones. Protect any valuable electronics in a laptop cabinet for children. Store your mail and notes to parents in the early childhood mail cubbies for announcements! 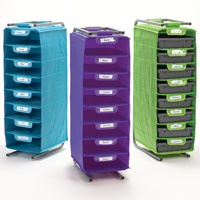 Store all of your classroom supplies in safety edged foldable cabinets and storage units for the classroom. 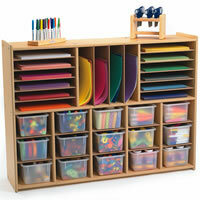 Choose from several toy boxes for classroom use and take over a wall with a wall storage unit! Keep backpacks and nap time animals in stackable lockers for children. Let�s talk books for children! You need a place to store all that literature. Choose the best children�s Bookcase from tabletop bookcases to child height book cases! Hang those adorable hand print art projects in our Art Drying Racks! 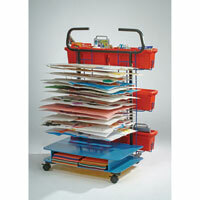 Allow children to step up to portable sinks and storage units with wooden Step Stools for classrooms! Soon you will have the best furniture for early childhood classrooms to teach and expand the minds� of your pupils! All you need now are some Tables, Chairs, Toys, and Sleeping Mats!